You could set cookies to be accepted all the time. This was the only way to get rid of this message and still retain DOM parsing functionality. -UseBasicParsing isn't a solution for me, because I want to use the functionality of what Invoke-WebRequest returns without basic parsing. This problem can be reproduced on every Windows 10 machine and completely destroys how Invoke-WebRequest can be used in a silent scripting environment, because the script hangs and waits for the dialog to be answered. Is there a way to still set Cookies to be accepted for all like in 8.1? I tried every setting in Internet Options in Windows 10, but nothing holds the key. I believe they stopped using it and perhaps moved that setting elsewhere, but I can't find it. Microsoft Edge doesn't have many settings either, so none of them were helpful. This is just infuriating. Any help would be highly appreciated, as this will create quite a chaos in many environments. Two small additions: Invoke-Webrequest seems not to re-read the Registry settings within a PoSH session, so after changing the Registry setting, close the PowerShell command session and re-open it before running IWR. The second is just two commands that will add the Registry value (first one) and delete it afterward (second one) so you can put them in your scripts. 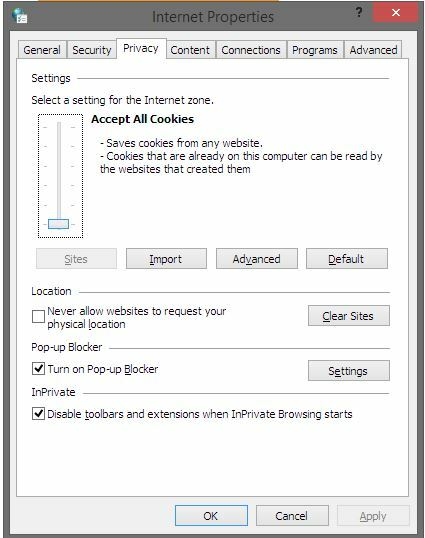 That way, you needn't constantly run IE in "accept all cookies" mode. Not the answer you're looking for? Browse other questions tagged windows powershell cookies windows-10 powershell-v5.0 or ask your own question. How do I run Invoke-WebRequest cmdlet from third party program?